Rectifiers simply consist of four diodes which are connected in a special way. They are used in power supplies to convert AC into DC. This conversion is called rectification. Rectifiers for different voltages and currents. Both, maximum voltage and maximum current is printed on the body as well as the polarization. Rectifier are simply four diodes in one housing. The way of connection is always the same. It is a ring circuit with two cathodes to plus (+) and two anodes to minus (-). Rectifiers vary in their maximum voltages and currents. Both specifications are printed on the body of a rectifier. In practice we will find two types of rectifiers: The B-type and the KMU-type. The voltage on a KBU-type is expressed in a letter code. Rectifiers are used in power supplies to convert AC to DC. This process is call rectification. The function of power supplies and the process of rectification is shown in details in the Power Supplies chapter. The transformer transforms the 230 V mains AC into low voltage AC. The rectifier converts the low voltage AC into DC. The capacitor smooths the output voltage. 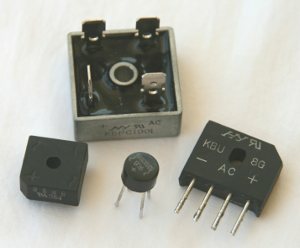 Rectifiers contain simple diodes. 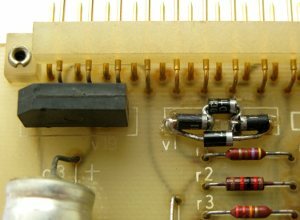 These diodes can be checked with an multimeter in diode-range. It is helpful to make a simple sketch of how the diodes are connected before measuring. The reason for defective rectifiers usually is overheating. But it is very likely that a short behind the rectifier is the reason for overheated rectifier. Always check the charge capacitor right behind the rectifier and the connected stages before changing the rectifier. Sometimes the polarization is not clear because of missing symbols on the body. The + lead is always marked. Often the corner of the housing is cut off and marks the + lead. Then, the - lead is opposite of the + lead and the other two are AC input. Rectifiers always contain four diodes. 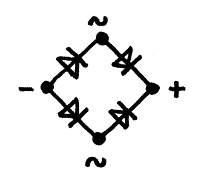 When a rectifier is needed but not available it can be easily build by four common diodes. Left the original rectifier. Right the replacement made out of four diodes.